New OSHA Regulations for controlling silica exposures in construction (Standard 1926.1153) will start being enforced September 23, 2017. The regulations apply to all occupational exposures of respirable crystalline silica in construction work. Exposures to respirable crystalline silica occur when tools such as chipping hammers, rivet busters, paving breakers (Jackhammers), rock drills, dowel drilling rigs, concrete saws (both handheld and walk behind), handheld grinders and hydraulic boom mounted breakers are used on concrete, brick, stone (granite and quartz), mortar and other materials that contain crystalline silica. 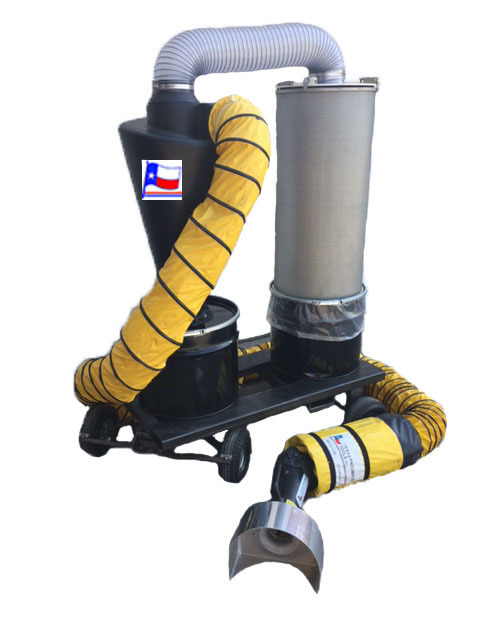 The Texas Pneumatic Dust Collection Systems are designed to comply with the standard. Our TX-DCS3 will work for all chipping hammers, rivet busters, rock drills and hand held paving breakers. It will also work for hand held saws and grinders. The TX-DCS3-F is a dry system that will contain the dust (crystalline silica) at the source and force it through the portable filter. Based on the OSHA guideline, filters are required to have an effeciency above 99%. A HEPA (High Effeciency Particle Accumulator) filter is designed to remove 99.97% of particles down to 0.3 microns in size. The portability of the unit allows it to be placed right where the chisels or drill bits are being used. The dust and small debris will be pulled away and forced through the filter which can be located anywhere within a 30 foot radius from the source. By locating the filter away from the work area, there is a lower probability of exposure to airborne crystalline silica particles.